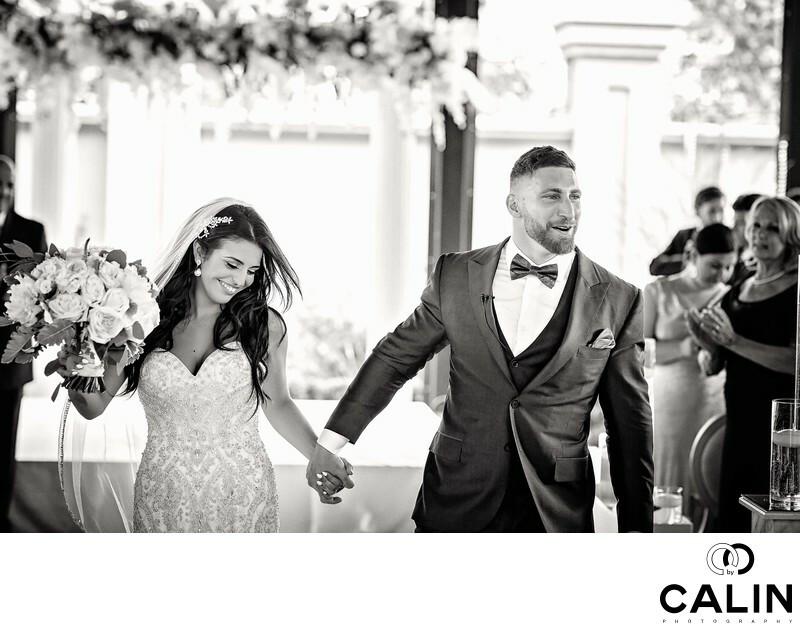 The pictures of the bride and groom during recessional depict a relaxed couple walking out after the tied the knot at Château the Parc. While both the processional and recessional are very emotional, it is usually a different kind of emotion that dominates each of them. Usually during the recessional, when the bridal party and the bride walk down the aisle, the couple and their guests are very tense for their quite a few things that can go wrong at this moment in time. There are lots of questions and concerns that race through the couple's mind: What if I stumble during my wows? Will the ring fit? Should I dip her during the first kiss? Should I pump my fist? Arguably, the bride and groom are prepared during the rehearsal but the big day is generally more emotional because it's the real thing. This wedding album spread features and ecstatic newlyweds couple who walks out holding hands and dancing together. This candid photograph captures the moment when the bride was turning towards the groom and both of them are laughing. I want to preserve the sense of motion and candid nature of the photograph so in post production I selected a black and white processing.